Our family had a little vacation last week. We spent a lot of time here. About the only plants at this California beach were ice plants. Not where you’d expect to see many ants, or so my family thought. They underestimated my ability to find ants. There are ants at the beach! Have you ever seen ants at the beach? no. never. It’s entirely admirable that you did! This is my first visit, and I love your blog. The water in that top photo is so inviting, such a beautiful color. My fave? #3. love that soft yellow. and the ant is cute too. Sorry, but I don’t find the first pic sooo very inviting, but I might be spoilt (or not very fond of mankind’s “nests”). But then I get to know this very proud and beautiful little worker – thanx alot. Yes, I’m afraid so. I thought maybe Coronado “Island” would be exempt, but it is really a peninsula. 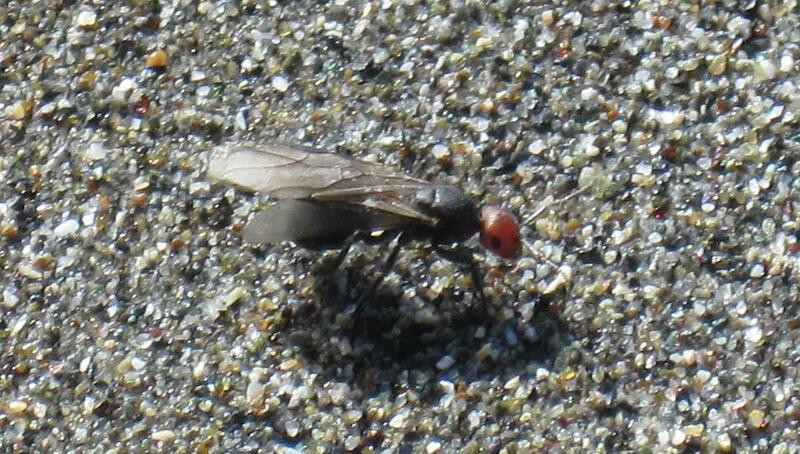 I found this one on the damp sand at Kellogg Beach in Crescent City, California. That’s the clearest shot I got before it flew away. It is an ant, isn’t it? Yes, it is a queen ant with wings (also called reproductive or alate).